Like Peter Cushing, I had only seen some dailies during the shooting, but I had a feeling that we had shot something incredible ! 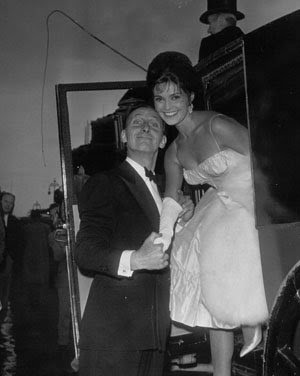 The premiere was held at Marble Arch Odeum(1). The production team had done things in a big way. I arrived in a horsedrawn carriage in front of the red carpet. Peter came to greet me. He opened the door and helped me get down. 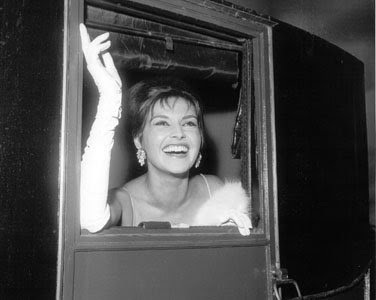 We joined the producers ( Michael Carreras, Anthony Hinds ) and their wives while flashbulbs exploded – thinking back, I can’t remember seeing David Peel or Terence Fisher that night. Usherettes disguised as vampires led us inside the theater. Dear Peter Cushing ! I preciously kept a magnificent scarf he had painted for me. Peter was an versatile artist. I came back to Italy, where I lived at the time. When the film was released there, I very gladly accepted to promote it (2). 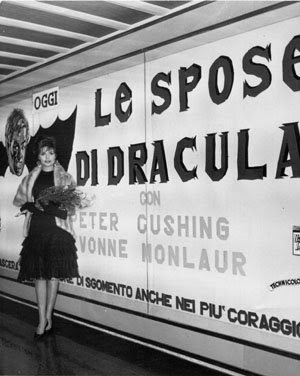 The italian title : " Le spose de Dracula " (The wife of Dracula) highlighted the couple I formed with David Peel. I want to pay tribute to Andrée Melly, Martita Hunt,Freda Jackson, Marie Devereux, Mona Washbourne who have infused the film with their talent and presence. Brides of Dracula has always had enduring success. such as Tim Burton (the mill scene in SLEEPY HOLLOW) or the Wachowski brothers (Gina’s resurrection scene is shown on a tv set in THE MATRIX RELOADED). (2) On the first day of exhibition, the movie broke several attendance records. (3) In Ravello, on the Amalfitan Coast. I've always loved BRIDES-one of my favorite Hammers and one of the most beautiful looking of their films. Thanks for sharing those photos of the premier-I've never seen them before. I can't believe it's taken me so long to find this blog! Fantastic to get the behind the scenes stories of two of my favourite horror films, Brides and Circus. Terror of the Tongs, by contrast, is one of the incredibly small number of Hammers I have never seen - I had no idea it was obtainable at all until I saw the DVD here - rest assured I will be snapping it up immediately... so it would be great if you could share some of your memories of that one with us too.